A third of Republicans and GOP-leaning independents oppose Donald Trump. 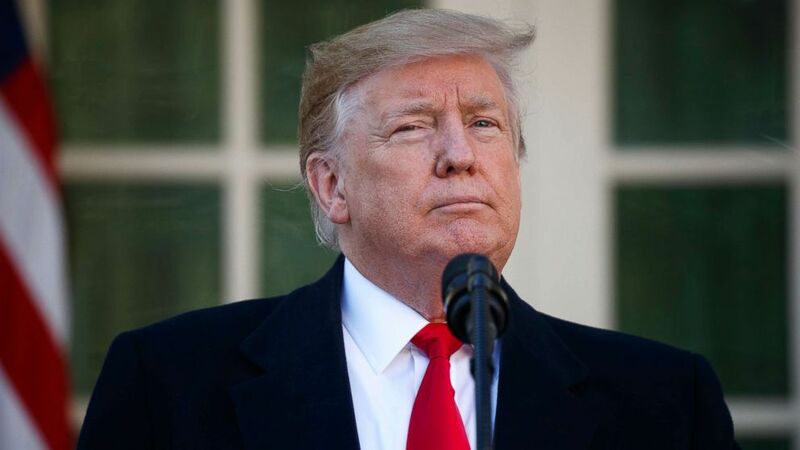 A third of Republicans and GOP-leaning independents oppose President Donald Trump for the party’s nomination to a second term and 56 percent of all adults said they wouldn’t consider voting for him -- two hurdles in his quest for re-election next year. But a potentially crowded Democratic field shows no sign of a clear front-runner across the aisle in this ABC News/Washington Post poll, and there’s deep division on priorities for the election season ranging from the relative importance of electability to key issues. In short, with 21 months to go, 2020 is anyone’s game. 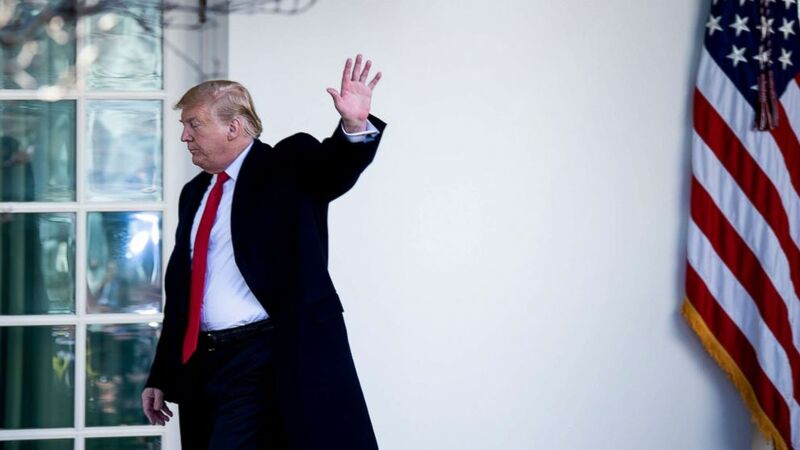 (Brendan Smialowski/AFP/Getty Images) President Donald Trump leaves after speaking about a temporary reopening of the U.S. government while making a statement in the Rose Garden of the White House, Jan. 25, 2019 in Washington. The nomination comes first. 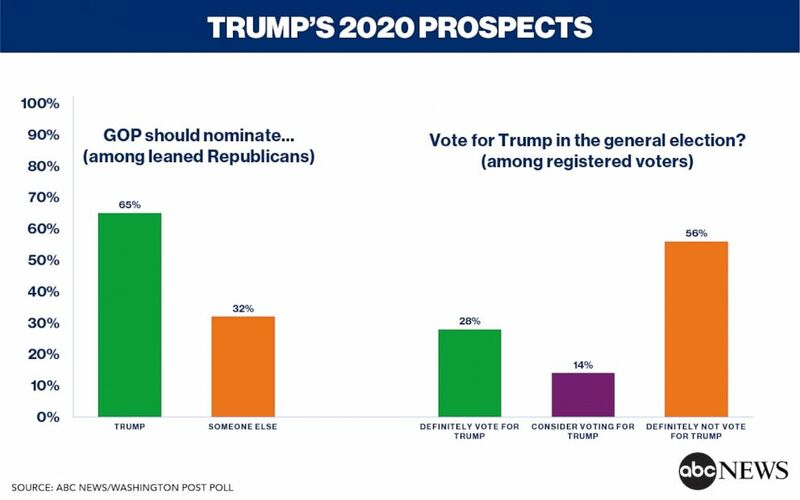 Thirty-two percent of Republicans and Republican leaning-independents said they’d like the party to nominate someone other than Trump as the GOP candidate for president in 2020. Among mainline Republicans -- excluding independents who lean toward the party -- 27 percent want someone other than Trump. Opposition to Trump runs as high as 41 percent of women, 42 percent of independents and 49 percent of moderates within the ranks of Republicans and GOP leaners. Sixty-five percent of leaned Republicans and 71 percent of mainline Republicans stick with Trump, plenty enough for him to secure the nomination. But the level of potential defections is high enough to raise concerns in his camp. So is the broader finding in which 56 percent of Americans said they definitely wouldn’t vote to re-elect Trump. That’s twice as many who said they’d definitely vote for him, 28 percent. A smaller share said they’d consider it, 14 percent. Results are identical among registered voters. Opposition to a second Trump term is significantly higher than former President Barack Obama encountered, peaking at 46 percent in Oct. 2011. Trump’s support in his base is more solid, with 70 percent of Republicans who said they’ll definitely vote for him, compared with 58 percent of Democrats for Obama in 2011. But Trump falls short when it comes to the often swing-voting independents: Fifty-nine percent said they wouldn’t consider him. Forty-seven percent ruled out Obama. (Evan Vucci/AP) President Donald Trump announces a deal to temporarily reopen the government in the Rose Garden of the White House, Jan. 25, 2019, in Washington. Trump also suffers among women, which is unsurprising given the wide gender gap in his job approval rating -- just 27 percent among women versus 49 percent among men -- as reported Friday. Nearly two-thirds of women in this survey, produced for ABC News by Langer Research Associates, said they definitely wouldn’t vote for him, compared with 48 percent of men. That includes 94 percent of Democratic women, 62 percent of independent women and 18 percent of Republican women. It’s 10 percent among Republican men. Other groups ruling out Trump include those without a religious affiliation, 73 percent, 77 percent of nonwhites, 88 percent of Democrats and 92 percent of liberals. Strong backing for Trump is comparatively lower, peaking demographically at 60 percent of evangelical white Protestants and reaching 70 percent only among Republicans and approvers of his work in office. Among the risks to Trump is the third of leaned Republicans who want the party to nominate someone else. Were Trump the candidate, just 12 percent in this group said they’d definitely support him. Forty-three percent would consider it -- and another 43 percent said they would not. Of course, such evaluations are hardly set at this point. In July 2015, 61 percent of registered voters said they would definitely not vote for Trump in the 2016 election, including three in 10 Republicans, a far cry from the final result. Uncertainty around a nominee abounds on the other side. Asked in an open-ended question whom they’d support in a primary or caucus today, 43 percent of Democrats and Democratic-leaning independents have no opinion and no individual prospects crack single-digit mentions. Former Vice President Joe Biden has 9 percent, followed by 8 percent for Sen. Kamala Harris, the Democrat from California who announced her candidacy just before this poll was conducted. Others mentioned include Sen. Bernie Sanders, 4 percent; former U.S. Rep. Beto O’Rourke, 3 percent; Sen. Elizabeth Warren, 2 percent; former first lady Michelle Obama, 2 percent; and Sen. Cory Booker, Montana Gov. Steve Bullock, former Secretary of State Hillary Clinton, Sen. Amy Klobuchar, Rep. Nancy Pelosi and Oprah Winfrey at 1 percent each. Also mentioned: former New York Mayor Michael Bloomberg, Sen. Sherrod Brown, former Housing and Urban Development Secretary Julian Castro, Sen. Kirsten Gillibrand, Colorado Gov. John Hickenlooper, former New Mexico Gov. Gary Johnson, Rep. Joe Kennedy, former Ohio Gov. Dennis Kucinich, Green Party activist Jia Lee, Rep. Bobby Scott, Sen. Kyrsten Sinema and Sen. Mark Warner. An additional 4 percent came up with an unusual choice for the Democratic nominee -- Donald Trump. The president won 8 percent of Democrats in 2016. This sort of result isn’t unique to this race nor this party. In a similar open-ended question asked of Republicans and Republican leaners in April 2011, 45 percent had no opinion. Eventual nominee and now U.S. Sen. Mitt Romney garnered 14 percent, followed by Trump at 6 percent and former Arkansas Gov. Mike Huckabee at 5 percent. Electability matters, but it’s not paramount to all. Democrats and Democratic leaners split on whether they’d prefer a candidate who is closer to them on the issues or one that seems most likely to defeat Trump in the general election, 47 versus 43 percent. Issue adherence is most favored by men at 55 percent, those making less than $50,000 at 52 percent and those under age 50 at 50 percent. A preference for beating Trump peaks at 52 percent of liberals and those making $50,000 or more. There’s also a lack of consensus within the party on issue priorities -- albeit with some preference for the bread-and-butter issue of health care, which performed well for the Democrats in the midterms. Presented with four potential top issues, 31 percent of leaned Democrats prioritized improving the health care system, compared with 21 percent for reducing economic inequality, 18 percent for reducing racial and gender discrimination and 15 percent who picked combatting global warming. Among the differences across groups, whites are more likely than nonwhites to focus on global warming at 21 versus 8 percent, while it’s the opposite on reducing discrimination at 13 percent of whites and 23 percent of nonwhites. More older adults prioritize health care, peaking at 40 percent of seniors. Inequality is a more compelling issue among college graduates than non-graduates at 27 versus 17 percent and, perhaps surprisingly, among those with $100,000-plus incomes compared with those who make less at 29 versus 19 percent. Those who’d rather have a candidate closer to them on the issues are more apt to prioritize health care at 39 versus 28 percent and less likely to focus on discrimination at 13 versus 21 percent. This ABC News/Washington Post poll was conducted by landline and cellular telephone Jan. 21-24, 2019, in English and Spanish, among a random national sample of 1,001 adults and 893 registered voters. Results have a margin of sampling error of 3.5 points, including the design effect. Partisan divisions are 32-24-37 percent, Democrats-Republicans-independents.